It appears on Match of the Day every week and is becoming an increasing part of football's language. But what exactly are we learning from expected goals, the new statistic which measures the quality of scoring chances? We wrote in detail about it in August. In a nutshell, statisticians Opta have analysed more than 300,000 shots from Premier League history and, based on a range of factors including the distance from goal, the angle of the shot and the type of opportunity it is, they are able to assign an xG value (a percentage) to every attempt to determine just how good a chance it is. Despite the season being only 11 games old, the expected goals metric is already highlighting patterns we might not otherwise have spotted. From the unlikely contender for an England World Cup place to signs that Leicester are not as far away as you might think from a return to the top end of the table, we take a look at some of the emerging stories. An unlikely England number one? Rarely has there been such competition for the England goalkeeper's jersey, with Joe Hart's indifferent form over the past 18 months prompting calls for the likes of Jack Butland, Jordan Pickford, Fraser Forster or Tom Heaton to be selected by manager Gareth Southgate. 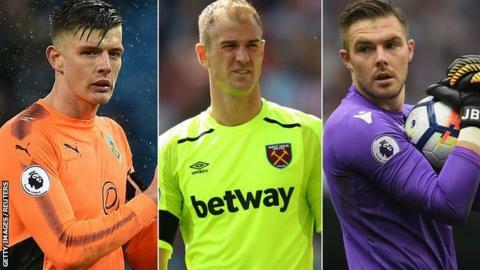 But with Burnley's Heaton injured, it is his replacement, Nick Pope, who has emerged as the Premier League's outstanding keeper this season, according to the stats. While expected goals primarily focuses on attacking play - identifying the quality of every chance created - it can also tell us about how keepers are performing. Based on the quality of chances he has faced, 25-year-old Pope ought to have conceded 10.9 goals this season - but has only let in five. That gives him an xG prevented total of 5.9 - the best in the division. That means Burnley ought to have conceded 5.9 goals more than they have done when Pope has been on the pitch. And that is not the only category which suggests Pope, who had eight loan spells during five years at Charlton before joining Burnley in 2016, is the top flight's best-performing keeper. Looking at all the shots he has faced, regardless of the quality of the chances, he is saving more than anyone else. That helps to explain how the Clarets have kept four clean sheets in their past six games. In fact, Pope has played eight league matches since coming into the side and has conceded just five times - three of them in one game away to Manchester City. "Burnley do the basics right so well but he's making fantastic saves at the right time," former England manager Sam Allardyce said on Saturday's Match of the Day. "Replacing Tom Heaton and waiting patiently for his chance is pretty impressive in my book." But while the stats are good news for Pope, they do not reflect so well on two of the other contenders for the England number one spot. Butland, who started the last international against Lithuania, is in the bottom two in both these categories, while Everton's Pickford does not fare much better. Butland has conceded 5.7 goals more than would be expected based on the quality of chances he has faced, while his record of saving only 54.2% of shots is worse than every Premier League keeper except Simon Mignolet. Expected goals - what is it? Leicester - targeting the top again? Leicester may already be on to their second permanent manager of the season but, despite a perception they have struggled following a winless run of six league games which led to Craig Shakespeare's departure, scratch beneath the surface and the signs are actually encouraging for new boss Claude Puel. Not only have the Foxes taken seven points from their past three league matches, including a win and a draw in the Frenchman's two games in charge, but expected goals tells us they are performing better than their overall results suggest. And that is one of the strengths of the expected goals metric - it can highlight underlying performance, both good and bad. For example, in 2015-16 Juventus won only three of their opening 10 Serie A games but their expected goal difference throughout that run was much higher than their actual goal difference. That suggested they were dominating matches and creating chances - they just weren't taking them. Over time, their actual goal difference moved closer to their expected goal difference and they eventually strolled to the title. Leicester's stats tells a similar story. Despite only being the eighth highest scorers in the division, expected goals tells us they are creating the highest-quality chances in the league. Opta determines that 14.8% of Leicester's openings ought to end in goals, based on how good an opportunity each one was. Champions Chelsea, by comparison, would only be expected to convert 8.4% of theirs. Which teams are creating the best quality chances? That is not to say Leicester are the best attacking team in the league, of course. Manchester City have the highest expected goals total, meaning they ought to be scoring more than any other side. But when the Foxes do create a chance, it is generally a good one. And it is not only in attacking areas that Leicester are performing well. They are the division's second-best side when it comes to restricting opponents to low-quality chances. So, teams might be scoring against Leicester, but the chances they create are generally not particularly good ones. The Foxes would be expected to concede from just 7.3% of the shots they face - only Tottenham fare better in this regard. Which teams are best at restricting opponents to low-quality chances? Leicester, then, do not allow opponents many clear chances and they create really good openings. Not a bad recipe for a new manager to work with. Liverpool manager Jurgen Klopp has been consistently criticised for failing to resolve perceived defensive issues - Watford are the only team in the top 13 to have conceded more than the Reds' tally of 17 goals in 11 games. The German has suggested those problems are being exaggerated and, on the face of it, you might think he has a point. The Anfield side have allowed only 86 shots on target all season, the second-lowest tally in the division. But the key factor here is how clear-cut those chances are. Liverpool allow opponents more high-quality scoring opportunities than any other top-flight team, with 15% of shots they face expected to end up as a goal. Which teams allow opponents high-quality chances most often? It is not surprising, then, that their record of conceding 19.8% of the shots they face is the worst in the Premier League. Crystal Palace are bottom of the Premier League, have won once in their opening 11 matches, are six points from safety and have a goal difference of -18. But expected goals reveals an underlying pattern to their performances and it hints at the potential for a revival under Roy Hodgson. The Eagles' expected goals differential for the season so far - the difference between the number of goals they ought to score and the number they ought to concede - is -2.73, the 11th best in the division. It suggests that, in all probability, if they continue playing as they are they will pick up more points on average per game than they have been doing so far. If you fancy goalmouth action, you would think Manchester City is the place to go - they've scored 38 times in the Premier League, 15 more than any other side. But this season's unlikely entertainers are Watford, whose strong start to the season under Marco Silva has taken them to ninth place. Expected goals allows us to assess chances, rather than just goals, and it tells us there should have been 34.2 goals in the Hornets' 11 games, more than at matches involving any other club. It is a sign of their positive attacking play - but also their vulnerability at the back. Both of those characteristics were in evidence on Sunday, as they conceded an injury-time winner to Everton in a thrilling 3-2 defeat at Goodison Park. Which teams' games have the most high-quality chances? That injury-time drama was par for the course for Watford fans. Their team have scored twice as many goals in the 90th minute or later as any other team - a tally they would have improved still further had Tom Cleverley not missed a 99th-minute penalty. Though they lost on this occasion, Marco Silva's men are certainly worth watching. Fancy yourself as an expected goals expert? Have a look at the following attempts and see if you can work out the percentage chance of each one ending up as a goal. Some of your information will be collected when you play this quiz. Click here to find out more. Is Salah Liverpool's new Suarez? Read more on Mohamed Salah: Liverpool's best goalscorer since Luis Suarez? 'He had to score!' True, or false?